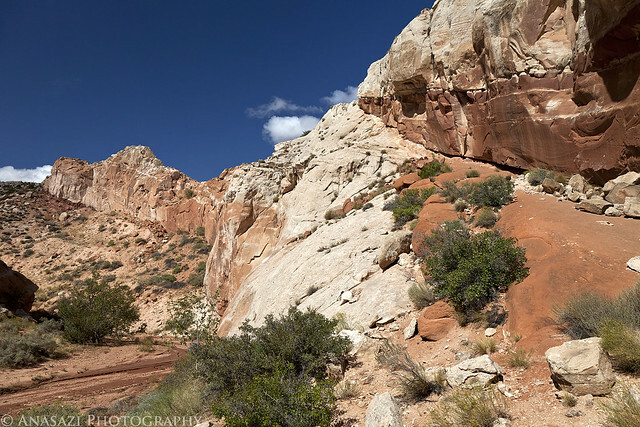 Our plan for Saturday was to drive from the Snake Gulch trailhead to Bluff, Utah. We would be going through Page, AZ and making a few stops along the way. 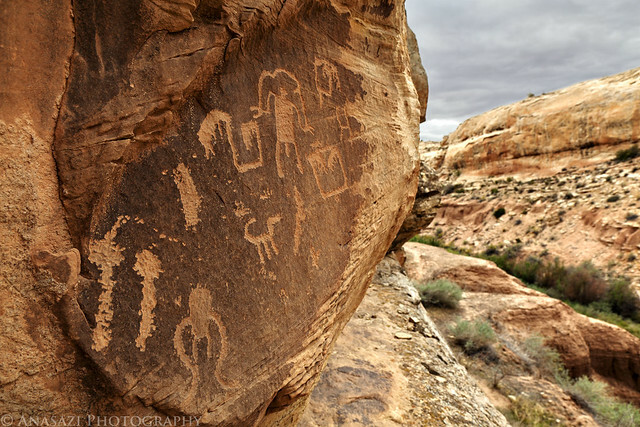 When we arrived in Bluff our plans were to search for some new rock art and then to setup camp along Comb Ridge somewhere. In the end we didn’t stick to that final plan. 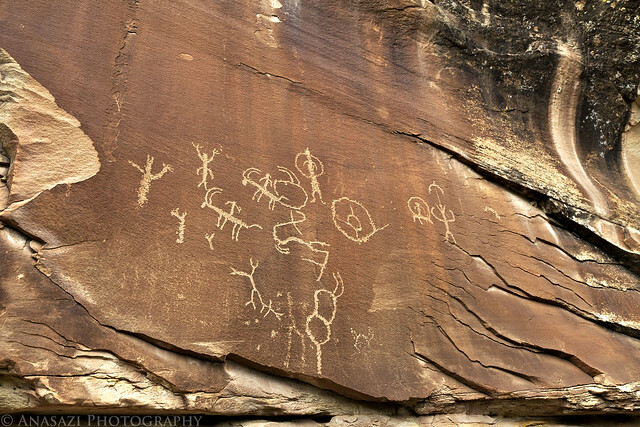 Our first stop was at a large alcove containing some rock art in Catstair Canyon. 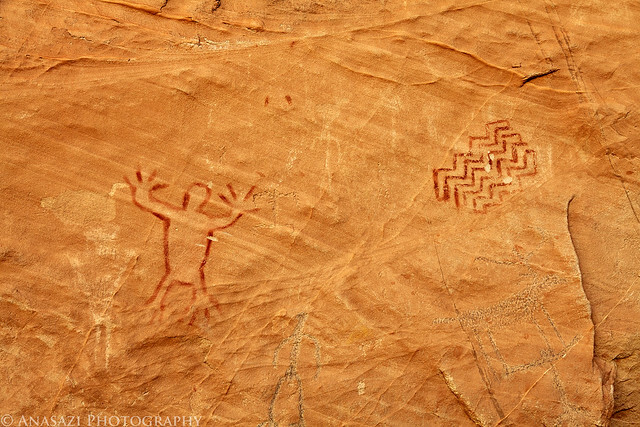 The lower portion of the panel has a few large petroglyphs and some red pictographs, but is pretty well vandalized. The higher panel is in a little better shape and has a red outlined anthropomorph and a zig-zag design. 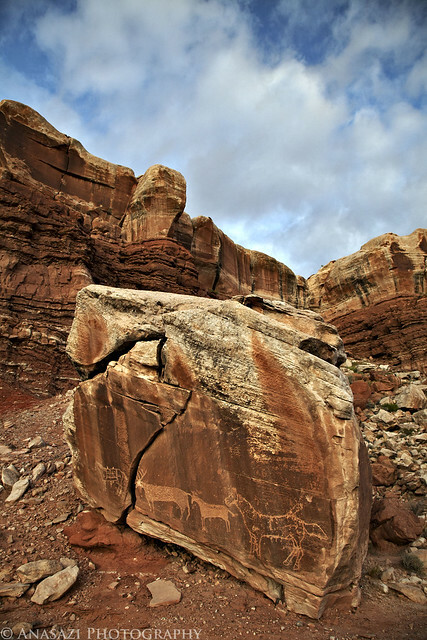 If you look closely, there are also some faint petroglyphs that are visible. A view in Catstair Canyon as it cuts through The Cockscomb. 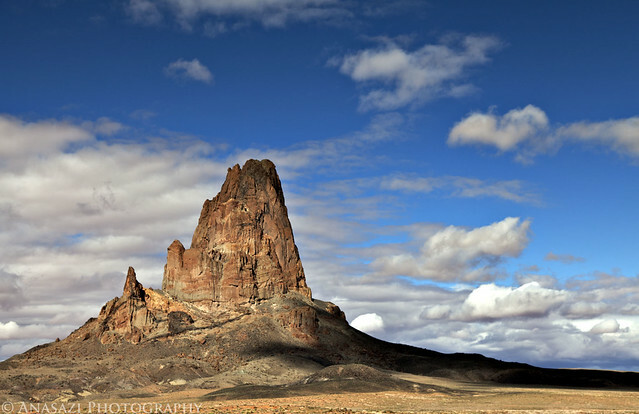 We continued on to Page where we made a quick stop for some lunch, and then we drove through the Navajo Nation to Kayenta and through Monument Valley. Shortly before crossing back into Utah I stopped for this photo of Agathla Peak. 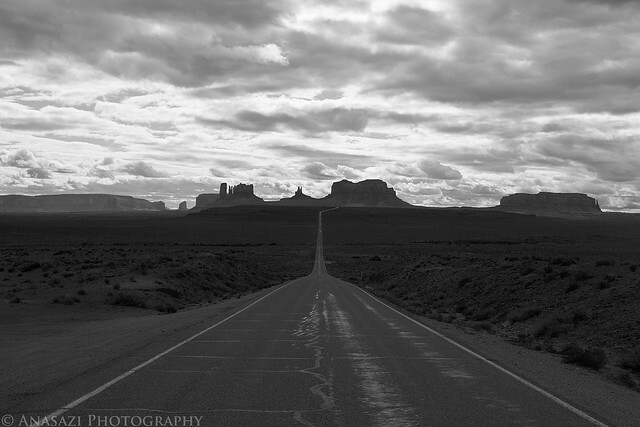 Looking back towards Monument Valley as we continue on towards Bluff. 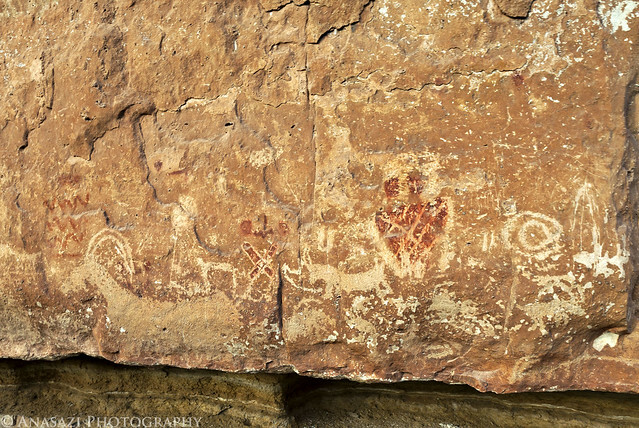 Before reaching Bluff, we stopped to visit a few new rock art sites. The first one was the Jump Rope Man. A wider view of the full panel. Then we stopped by Sand Island so that we could hike to the upper sites that I’d not been to before. This was the first panel of petroglyphs we came across. 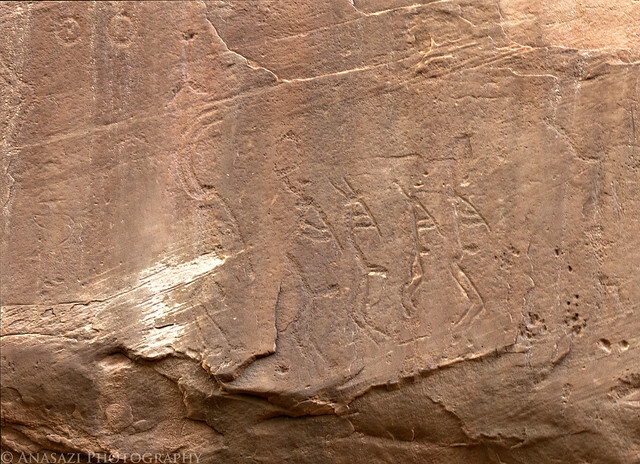 We found many other faint petroglyphs along the way, but most of them didn’t photograph very well. 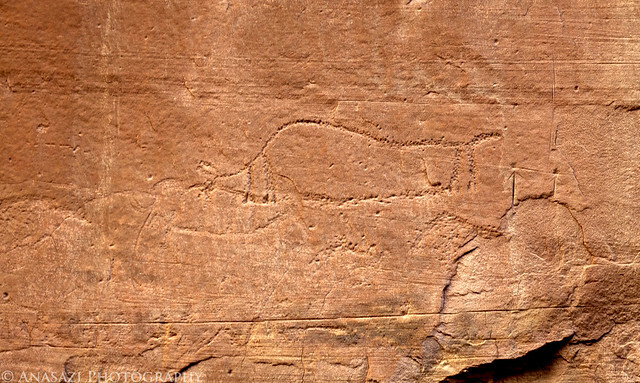 This very faint petroglyph is thought to be of a mammoth and is possibly one of the oldest petroglyphs around. Here’s some more info about it. A line of flute players that Jared spotted before we hiked back to the Jeep. 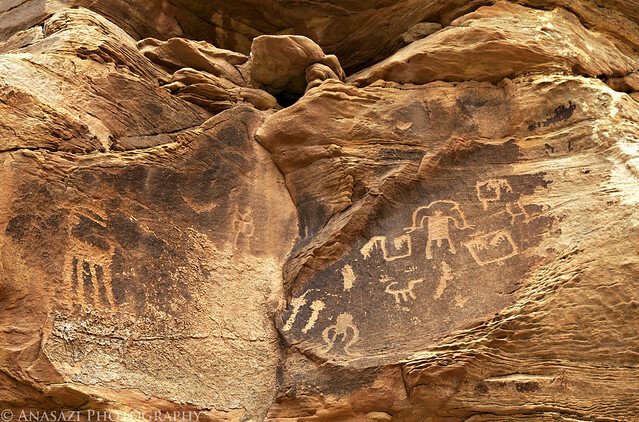 Next we visited a large boulder that contains a couple of petroglyphs of horses and deer. 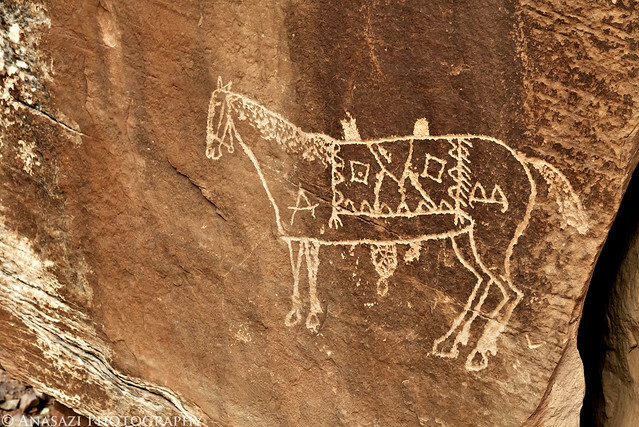 A closer look at the highly-stylized horse. 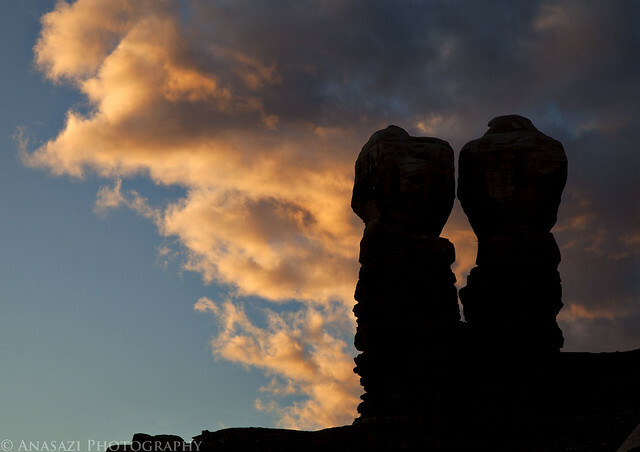 Before leaving town and driving north, I stopped for a photo of the Navajo Twins in silhouette at sunset.